Flowers on Stamps, Topical Stamp Packet, 100 different stamps. This topical stamp mixture of 100 different Flowers on stamps, is a mixture of stamps, from various countries of the world. Flowers on Stamps, Topical Stamp Packet, 100 different stamps. Enjoy working in this flower garden. 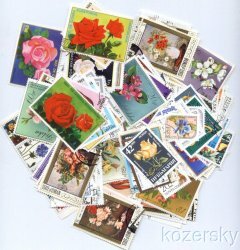 This topical stamp mixture of 100 different Flowers on stamps, is a mixture of stamps, from various countries of the world. This mixture of canceled, mint, and/or used, all different stamps, may also contain sets. 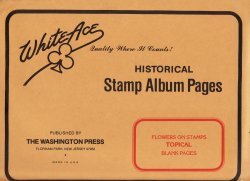 These stamps are an excellent way to begin or enlarge a stamp collection. Scan is an example of the contents of the collection.